During November–December 2008, a salvage excavation was conducted at the tell within the village (Permit No. A-5552; map ref. 20469–72/69711–5; Fig. 1), prior to construction. The excavation, undertaken on behalf of the Israel Antiquities Authority and underwritten by Mr. A. Abu Habla, was directed by R. Toueg, with the assistance of A. Hajian (surveying and drafting), T. Sagiv (field photography), D. Masarwa (preliminary inspections), M. Peilstöcker, E. Yannai and P. Gendelman (ceramic consultation), M. Shuiskaya (pottery drawings), Y. Gorin-Rosen and N. Katsnelson (glass) and D.T. Ariel (numismatics). 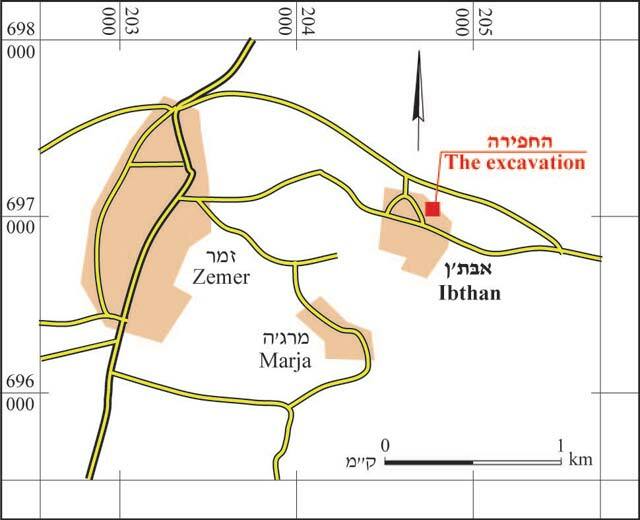 The site is located in the eastern Sharon plain, at the foot of the Samarian Hills, in a region of hard limestone hills separated by ravine channels that drain to the west. Building remains had previously been excavated at the site and potsherds that dated mostly to the Hellenistic period, as well as the Roman and Byzantine periods were collected (HA-ESI 118). Farming terraces and scattered ashlars were documented in a survey along the northern slope of the tell (License Nos. G-134/1998, G-29/2001) and potsherds that dated to the Hellenistic, Roman and Byzantine periods were gathered; walls were found in probe trenches. 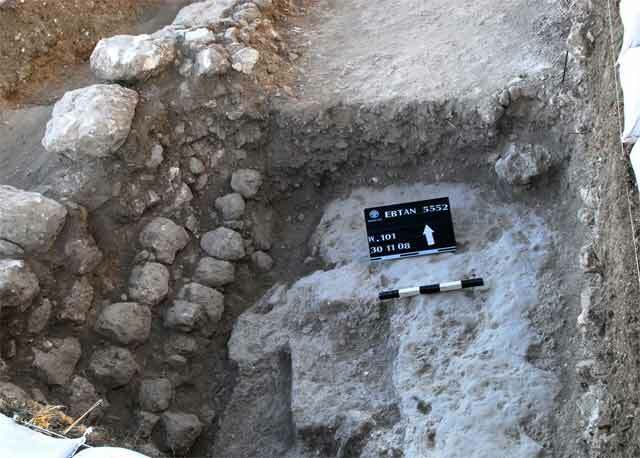 The excavation was conducted on the northern slopes of the tell, in an olive grove surrounded by buildings, c. 100 m west of the previous excavation. Two squares were opened at the western end of the property and three strata (I–III) that consisted of rock-cuttings and building remains were exposed. Bedrock sloping to the northwest, in which two shallow rock-cuttings of building stones were hewn, was exposed in the southeastern corner. A straight cut line was discerned at the western end of a bedrock surface (length c. 1 m; Fig. 2); it extended southward, beyond the limits of the excavation. The rock-cutting could not be completely exposed, due to conditions in the area and time constraints; therefore, its date and function could not be ascertained. 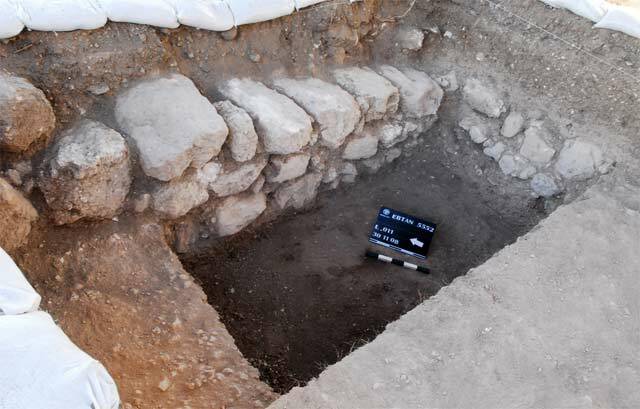 A small part of a building that dated to the end of the first century BCE or the beginning of the first century CE was exposed. A wall (W102; Fig. 3) that continued west, beyond the square, was exposed alongside the northeastern balk. Wall 102, preserved two courses high, was built of large carelessly dressed stones, among which an ashlar that was originally used as an architectural decoration and a voussoir, were incorporated in secondary use. Wall 102 was set on a foundation course that superposed a fill (L11), which contained fragments of pottery vessels from various periods. Above the bedrockand below the fill, terra-rossa soil (L13) was excavated. A thinner wall (W103; min. length 1 m) in the northeastern corner of the square, which protruded slightly from the eastern balk, abutted W102. Wall 103 had survived by a single course of carelessly dressed stones, built above a foundation of small fieldstones that was placed on fill (L6). It seems that W102 delimited the building from the north, whereas W103 was an interior wall. Layers of fill, excavated in a probe along W102, contained potsherds of various vessel types and periods, ranging from the Middle Bronze Age until the first half of the first century CE. Below L6 in the west, another fill (L9; to a depth of c. 1 m), which extended to the west and south and contained small fieldstones and numerous potsherds from a variety of periods, was excavated; this may have been a refuse pit. A wall (W101; Fig. 4), built of stones in secondary use, was exposed below the surface in the southwest. It was founded in the east on a stepped foundation of small fieldstones, which was set in the rock-hewn line of Stratum III, close to its eastern edge and on a fill that was not excavated (Figs. 2: Section 2-2; 5). Wall 101 continued to the south and apparently formed a corner with a wall that ran perpendicular to it and was exposed in the preliminary inspections, c. 0.5 m southwest of the excavation area. A door threshold that opened to the west was located at the northern end of W101. 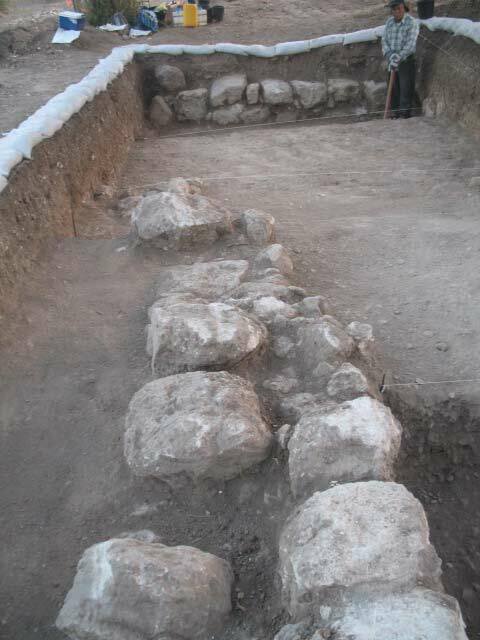 Collapse that consisted of large stones and a few potsherds (L12) was found in a probe excavated northwest of W101, contrary to the layers of fill excavated to the east; five courses of the wall were exposed but the excavation was not completed. 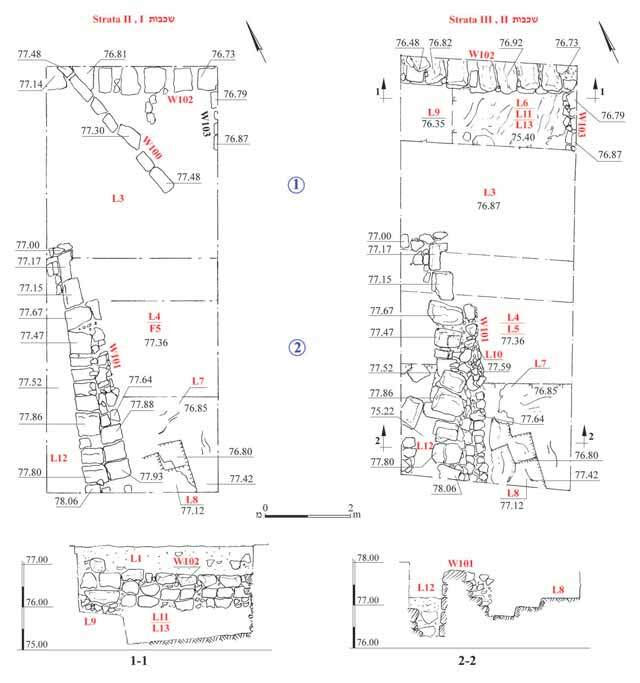 Wall 101 was made thicker (total width 1 m) in a later phase; a row of different size stones, carelessly built on soil fill (L10), was affixed to its eastern side. A floor (L5; thickness c. 0.2 m) of small fieldstones and potsherds, overlain with a tamped layer of crushed chalk, abutted the eastern side of the thickened addition to W101. Floor 5 was founded on fill (L7) that rested on bedrock and contained potsherds from the end of the second century BCE–beginning of the first century CE. The fills (L3, L4) below the surface contained a large amount of carelessly made white tesserae (4×4 cm) and potsherds that dated from the end of the Hellenistic and the beginning of the Roman periods, as well as three pottery fragments from the Middle Ages, including one from the Mamluk period, and a poorly preserved coin that is illegible. A wall (W100), preserved a single course high, was exposed in Square 1. Its orientation was different from the earlier walls and it extended from the center of the square to the northwestern corner, above W102, beyond the excavation limits. The fill on either side of W100 contained poorly preserved fragments of glass vessels, including bowls that dated to the end of the Roman–beginning of the Byzantine periods (fourth–fifth centuries CE), as well as a small bottle and a bracelet decorated with a red trail that are dated to the end of the Byzantine period and possibly, the beginning of the Early Islamic period. A wide variety of potsherds, spanning the occupation periods of the tell, was found. The earliest were dated to Middle Bronze Age II and included a pithos fragment (Fig. 6:1), a jar (Fig. 6:2) and a jar base (Fig. 6:3) from the eighteenth–sixteenth centuries BCE. A collared rim of a jar (Fig. 6:4) should be ascribed to the end of the Late Bronze Age–beginning of Iron Age I (thirteenth–eleventh centuries BCE). The ceramic artifacts from the Persian period included a bowl (Fig. 6:5), a cooking pot (Fig. 6:6) and a jar (Fig. 6:7) from the fifth–fourth centuries BCE, a jug (Fig. 6:8) from the sixth–fifth centuries BCE and the bottom part of a pinched lamp (not drawn). The ceramic finds from the Hellenistic period included a fish plate (Fig. 6:9) from the fourth–second centuries BCE, a jar (Fig. 6:10) from the third–second centuries BCE), a jug (Fig. 6:11) from the fourth–second centuries BCE, a lamp wick of a dolphin-type lamp, a number of glass vessel fragments and animal bones. The pottery vessels from the Early Roman period included a bowl (Fig. 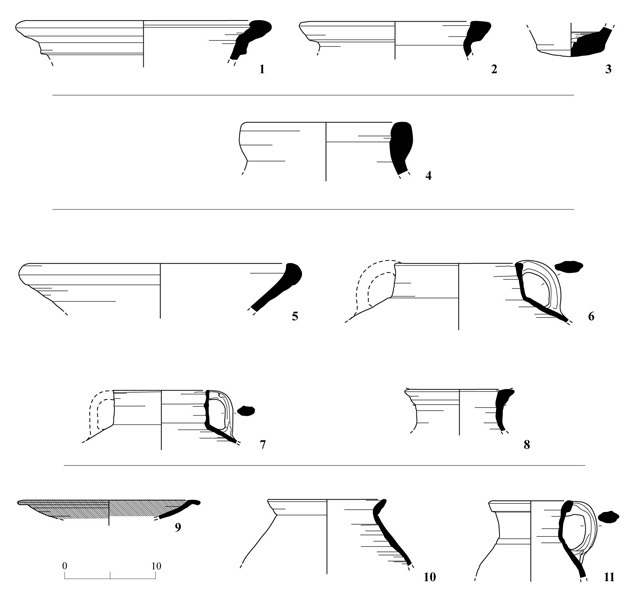 7:1) from the second–first centuries BCE, an Eastern terra sigillata-type bowl (Fig. 7:2) from the end of the first century BCE–beginning of the first century CE, a cooking pot (Fig. 7:3) from the first century CE, a cooking pot (Fig. 7:4) dating to the years 70–125 CE, a bag-shaped store jar (Fig. 7:5) from the end of the first century BCE–beginning of the first century CE and a jug (Fig. 7:6) from the first century CE. The latest discovered potsherd dated to the Mamluk period. Due to the limited scope of the excavation, it was not possible to completely expose the architectural complex from Stratum II, which was apparently a relatively large structure. Among the potsherds recovered from the foundations of the walls and below Floor 5, which dated the construction of the building, the latest were from the end of the first century BCE–beginning of the first century CE. The latest of the pottery fragments, revealed in the excavation of the floor, dated to the end of the first–beginning of the second centuries CE, hence the building continued to be used at that time period. The building was probably abandoned in an orderly manner, as no signs of destruction were detected in the excavation. The potsherds from the period when the building was in use were fine, unlike the worn pottery fragments from the earlier periods that were probably swept over from the hilltop. These indicate that the habitation of the tell began in the Middle Bronze Age and continued, possibly without interruption, until the end of the first century–beginning of the second century CE. Run-down fragments of glass bowls that dated to the end of the Roman and the beginning of the Byzantine periods, as well as the results of the previous excavation and surveys, indicate that a settlement existed on the tell at this time as well. The meager potsherds from the Middle Ages may possibly attest to a settlement on the tell during this period as well, although its remains should probably be sought on the higher parts of the mound. 3. Walls 102 and 103, looking northeast. 4. Wall 101, looking northeast. 5. The rock-cutting and Wall 102, looking northwest. 7. Pottery from the wall foundations and below Floor 5.